Cathy Harris is an Empowerment and Motivational Speaker, Non-GMO Health and Wellness Expert, Self-Publishing and Business Coach, Advice Columnist and Love Coach at DearCathy.com and former Federal Whistleblower at TheCathyHarrisStory.com. Cathy Harris Launches "The Essential Women's Movement for African American Women"
On Jan. 29, 2017, Austin and Dallas business woman, Cathy Harris, launched "The Essential Women's Movement for African American Women"(http://www.EssentialMentors.com), which is a new national movement for African American women mentors, who will uplift, empower and share information with other women, girls and boys. As we work alongside of male business owners, we will refer young boys to men with 'ethical' shadowing/mentoring businesses. Our goals are to become "100% self-sufficient" in our dealings with each other as we grow and build "legitimate" businesses. We will especially focus on matching up "Baby Boomers" with "Generation X's" and "Millennials." We ask that you not be involved in any type or Network and Multi-Level Marketing venture (Pyramid Scheme) or any other 'unethical' business practice, including businesses that don't teach self-sufficiency such as "Non-profits". Instead we ask that you investigate "For Profit" businesses. We will not ask anyone to donate to us, but instead we will ask that everyone investigate and recommend our 'ethical' services and products to others. Everyone, no matter how young or old, has some type of skill, talent or passion, which is of value to others, so therefore, we will form business alliances, strategic partnerships and co-ops to help each other lay out our own platforms, as we form supportive 'ethical' networks around each other. Not everyone is on social media, especially facebook.com, so it will be imperative that everyone join our mailing list at the links below. You can also sign up your own family members, friends, neighbors and colleagues yourself by going to the links and just filling in an email address, however, please inform them that you have signed them up. To bring women aboard this campaign and new initiative, we will start off with virtual training through a series of YouTube.com presentations, FREE weekly teleconference calls at (712) 770-4715, Pin/Access Code #243460 (backup number (716) 293-9621), every Tuesday from 7:00-8:00 p.m. (Central) starting on Jan. 31, 2017 and regular posts in e-newsletters, and we will post these advertisements on the below facebook.com and meetup.com groups so join both of these groups so you don't miss the weekly or bi-weekly action plans. 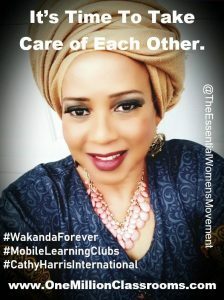 Your only qualifications to be a part of our network and this new movement is you must have a great love for the black community. Our motto is "Motivating Women to Greatness" and we are located on Facebook.comand Meetup.com. Cathy Harris is an Empowerment and Motivational Speaker, Non-GMO Health and Wellness Expert, Advice Columnist and Love Coach at DearCathy.com, Self-Publishing and Business Coach. She is also the author of 26 non-fiction book s including 6 health books and 2 business books, and she provides seminars, workshops, webinars and consultations through her speaking and training platforms at http://www.cathyharrisinternational.com and can be reach through her empowerment company, Angels Press, CEO, President, Publisher, P.O. Box19282, Austin, TX 78760, (512) 909-7365, Phone: (512) 909-7365, Website: http://www.AngelsPress.com Email: info@angelspress.com. Business Action Steps for "The Essential Women's Movement"
First Business Action Step for "The Essential Women's Movement" - Are You Wired for Business Ownership? 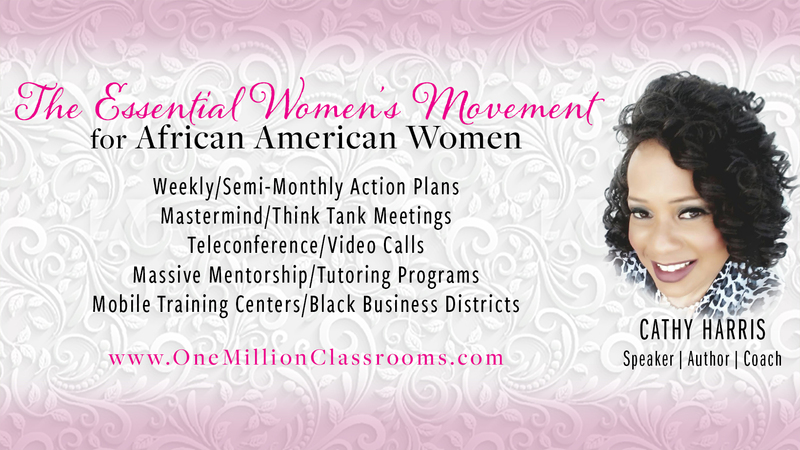 Second Business Action Step for "The Essential Women's Movement - Are You Setting Your Kids Up for Failure? Fourth Business Action Step for "The Essential Women's Movement" - Can Forming Business Alliances and Strategic Partnerships Help Save Black Communities? Community Action Steps for "The Essential Women's Movement"
Third Community Action Step for "The Essential Women's Movement" - Is It Too Late for Black Folks?